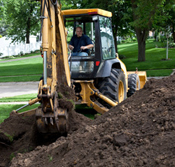 Kinder Brothers Excavating is a commercial excavation contractor. We offer commercial and government contracting services in southeast Missouri, northwest Tennessee and northeast Arkansas. Kinder Brothers is family owned and operated and has been serving the area since 1987. Services include excavation, slope restoration, site preparation, leveling and drainage, riprap, clearing, gabion baskets, and demolition. We have built a solid reputation over the years, and have a record of completing jobs on time. At the beginning of our projects we have a big push to get started. This allows us to operate ahead of schedule and ensures jobs are completed on time. We look forward to hearing from you. We can be reached at 573-624-4858. Serving throughout southeast Missouri, northwest Tennessee and northeast Arkansas.